BATON ROUGE, La. (Reuters) - U.S. President Barack Obama walked door to door in an East Baton Rouge Parish neighborhood on Tuesday hugging people and offering assurances that the country would help them recover from some of the worst floods ever recorded in Louisiana. "What I want the people of Louisiana to know is, you’re not alone on this, even after the TV cameras leave," Obama said after touring brick homes whose lawns were cluttered with slabs of drywall and soaked sofas and mattresses. More than 2-1/2 feet (more than 76 cm) of rain fell on parts of the state in the worst U.S. disaster since 2012's Superstorm Sandy. At least 13 deaths have been attributed to flooding and more than 60,000 homes have been damaged. More than 100,000 people have applied for federal aid, Obama said, and so far more than $120 million has been approved. Many people did not have flood insurance. How much will be needed to help residents has yet to be determined, Obama said, noting that Congress may need to approve more aid. He urged Americans to volunteer and to donate money to the Red Cross. "This is not a one-off. This is not a photo op issue. This is, how do you make sure a month from now, three months from now, six months from now, people still are getting the help that they need," Obama said. Naketa Woods, who owns a home in Castle Place, stood in her driveway in the sweltering heat with her husband waiting to meet with Obama. She said their home was filled with 3 feet of water and they lost all their furniture and two vehicles. 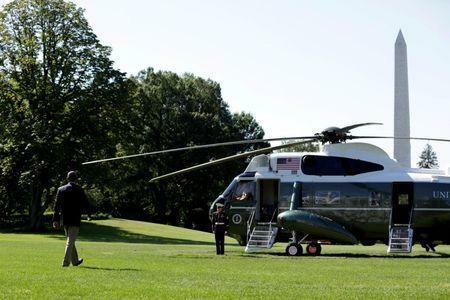 "To have the president come, it means a lot to show that he cares and the federal government cares about what we are going through," Woods said. Obama was criticized last week for not cutting short his New England vacation to go to Louisiana. Republican presidential candidate Donald Trump, who was in Louisiana on Friday, said on Twitter, "President Obama should have gone to Louisiana days ago, instead of golfing. Too little, too late!" 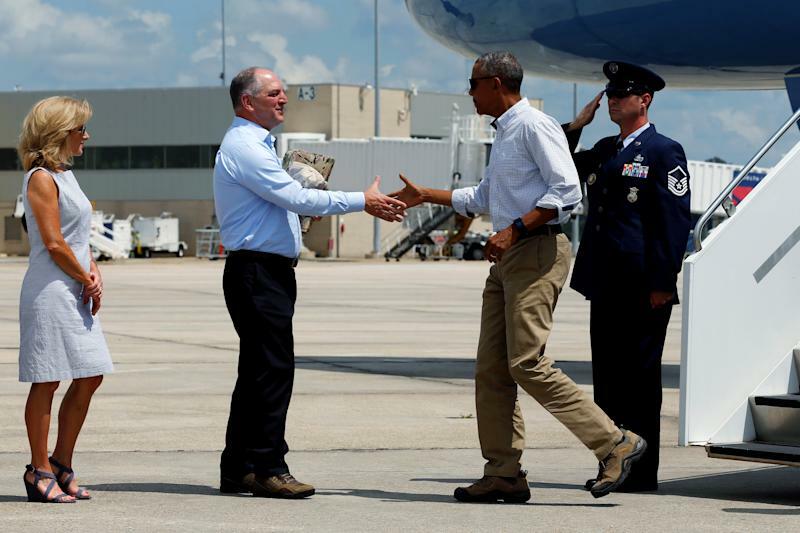 However, Democratic Governor John Bel Edwards had asked Obama to delay his visit because presidential visits require a huge retinue of Secret Service agents and tie up local and state law enforcement resources needed elsewhere in disasters. Edwards had asked Trump not to visit for a photo opportunity. 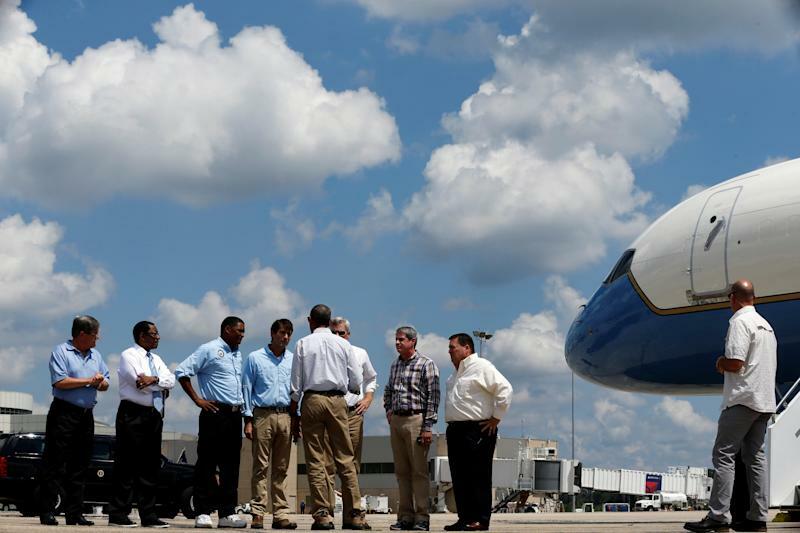 Obama had received updates on the flooding from U.S. Homeland Security Secretary Jeh Johnson and Federal Emergency Management Agency Administrator Craig Fugate, both of whom went to Louisiana. "Nobody gives a hoot whether you're Democrat or Republican. What they care about is making sure they're getting the drywall out, the carpet out, there's not any mold building," he said. Louisiana Lieutenant Governor Billy Nungesser, a Republican, dismissed the debate. "I'm just glad he's here," Nungesser told MSNBC in an interview. He said he hoped Obama's visit would bring hope to the state's residents. "We're going to need a lot of help, a lot of prayers, and a lot of work to get back," Nungesser said. The White House said that while in Baton Rouge Obama would meet with the family of Alton Sterling, a black man shot dead by white police officers in July and the families of officers of the Baton Rouge Police Department and East Baton Rouge Sheriff's Office who were killed and injured in an attack that month.